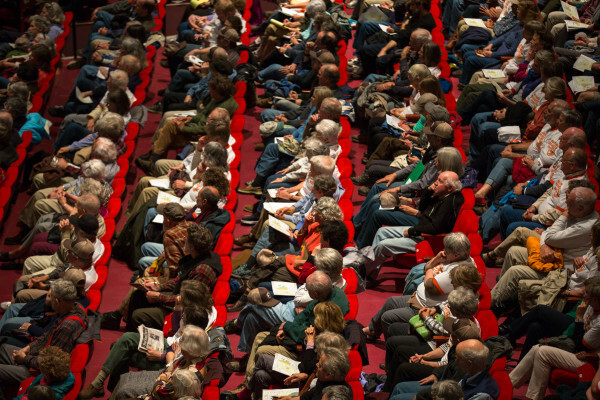 The audience of the day's second public forum on a monument proposed by Roxanne Quimby's family for lands east of Baxter State Park listens on May 16 at the Collins Center for the Arts on the University of Maine campus in Orono. EAST MILLINOCKET, Maine — Gov. Paul LePage will be the first witness at a field hearing of the U.S. House Committee on Natural Resources next week in which only opponents of a proposed North Woods national monument are scheduled to speak, officials said Thursday. The Republican governor will join Bob Meyers, executive director of the Maine Snowmobile Association, Millinocket Town Councilor Paul Sannicandro, state Rep. Steve Stanley, D-Medway, and David Trahan, executive director of the Sportsman’s Alliance of Maine, as speakers whom committee members invited to the hearing at the town office at 2 p.m. Wednesday, June 1, committee spokeswoman Elise Daniel said. All have opposed and represent organizations opposing President Barack Obama’s issuing an executive order that would create a monument out of about 87,500 acres east of Baxter State Park owned by the family of entrepreneur Roxanne Quimby. Family members and a paid lobbyist have been in talks with the White House regarding the proposal since at least November. Daniel said minority Democrat committee members contributed vastly to the apparent lack of balancing viewpoints. They have declined to invite pro-monument witnesses and have themselves refused to attend the hearing, she said. A minority spokesman said the hearing is imbalanced because the majority members declined to name pro-monument witnesses. “Everyone who will be speaking will be partial to their viewpoint but comes from a wide variety of interest areas and activities. The only problem that we have is the quantity of time, how many you could actually get in that space of time,” Bishop said Thursday. U.S. Rep. Bruce Poliquin, R-Maine, will host a forum at the town office regarding the monument at 3:30 p.m., after the committee hearing, said Brendan Conley, Poliquin’s spokesman. Bishop called the forum a separate but “free flowing continuation” of the hearing that committee members can participate in. “I assume everyone is going to say something, and those [pro-monument] ideas are going to come through” at Poliquin’s forum, Bishop said. “This so-called hearing is not about bringing new information. It’s a political stunt, and it is more about politics for Gov. LePage or Congressman Poliquin than it is about public policy,” said Farmer, a Bangor Daily News columnist. Titled “Elevating Local Voices and Promoting Transparency for a Potential Monument Designation in Maine,” the hearing will not provide time for public comment from the audience. Each speaker, who will not be sworn in before testifying, will have five minutes. When they have all finished speaking, committee members can question them, Daniel said. Under House rules, audience members attending the hearing will not be allowed to speak but will be granted the opportunity to fill out comment cards that will become part of the record, Daniel said. Bishop and U.S. Rep. Bruce Westerman, R-Arkansas, were the only members of the 44-member committee who had agreed to attend as of Thursday. The committee consists of 26 Republicans and 18 Democrats. Committee members also will visit the proposed monument land earlier in the day Wednesday, Daniel said. Adam Sarvana, spokesman for the House committee’s 18 minority Democratic members, said that they didn’t see the point in attending the field hearing because it would be biased against the monument proposal. U.S. Rep. Chellie Pingree, D-Maine, who favors a monument and is not a member of the committee, is more hopeful, said her spokesman, Willie Ritch. “She hopes that the committee will hold a balanced hearing in which they allow both sides to be fairly represented — like the public meeting held by Senator [Angus] King and the director of the park service,” Ritch said in an email. King, I-Maine, hosted forums regarding the monument on May 16 at Katahdin Region Higher Education Center in East Millinocket and the University of Maine in Orono. National Park Service Director Jonathan Jarvis attended both. Poliquin has a bill pending that would restrict presidential authority to designate monuments. King has said that he has gone from opposing the plan while governor a decade ago to listening to viewpoints on the proposal. The forums showcased how the proposal has bitterly divided local residents on each side of the debate and the pro-park constituency around the state from opponents in the Katahdin region. LePage and some Katahdin region officials described the King forums as “a fix” because they lacked balanced representation of pro- and anti-monument leaders. LePage’s spokeswoman, Adrienne Bennett, did not immediately return a request for comment on Thursday. It remains unclear what impact the House field hearing or the forums will have on the decision, which Obama can make unilaterally. Committee members chose the hearing witnesses, in consultation with Poliquin’s office, seeking to include a variety of witnesses with different backgrounds, Daniel said. Sarvana disagreed, saying that the committee didn’t even invite St. Clair to discuss his family’s proposal. In a statement released by his office late Thursday, Poliquin urged Democratic committee members to attend the hearing. “Congressman Poliquin is disappointed that the Democrats on the committee are not taking this opportunity to have local voices heard seriously. The committee has its own sets of rules and those rules do not allow for public comment other than those given by witnesses that are selected by the committee,” said his spokesman, Brendan Conley, in a statement. “The committee has agreed to allow us to record the public comment forum so that it can be included into the official Congressional Record,” Conley said. Correction: An earlier version of this story reported that Rep. Bruce Poliquin will host a forum at 4 p.m. It will be at 3:30 p.m.